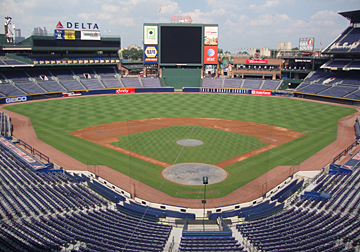 Turner Field is home to Major League Baseball's Atlanta Braves, the longest existing baseball franchise in the world. 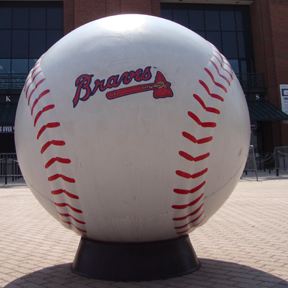 Named for TBS mogul and former Braves owner, Ted Turner, Turner Field tours are available year-round, with few exceptions. The structure is relatively new. The 1996 Olympic Stadium was converted to today’s baseball-only venue in only seven months following the conclusion of the Olympic and Paralympic Games. Only a portion of the then-existing stadium was rebuilt. I’d been to quite a few Braves Games when I previously lived in Atlanta, at both Fulton County Stadium and Turner Field, and have been again (to see them win!) since returning to Atlanta. However, I had never taken advantage of the behind-the-scenes tour. Immediately recognizing our tour guide’s broad baseball knowledge base and enthusiasm, the likes of which I've not seen on a tour in quite some time, I knew the experience would be quite informative and exciting. Rick's tour was sure to be a home run. What was in store for us? We started with a self-guided visit of the Braves Museum & Hall of Fame and then Rick took us to Sky Field, the press box, the TV/radio booths, the Braves Clubhouse and locker room (they were on an away game), the Braves’ dugout, and then onto the playing field! The Braves Museum & Hall of Fame serves as home to the Braves' 1995 World Series Championship trophy. Locker-shaped enclaves house memorabilia from the various pennants won by the Braves throughout the 1990s and 2000s. Time-traveling to the beginning of Braves history, displayed artifacts told the story of pre-1960s Braves incarnations. The largest artifact—bigger than the World Series trophy—is a rail car that the Braves used to travel to away games, decades ago. Sky Field's panoramic views of Turner Field and downtown Atlanta are a sight to see. Anyone with a game day ticket can visit Sky Field. 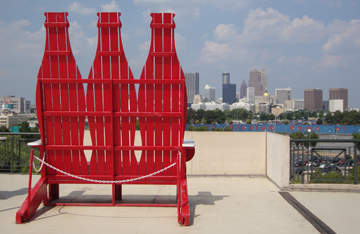 This is where the giant, illuminated Coke bottle is nestled, where the giant Chik-fil-A cow does the tomahawk chop during games, and where you can sit in giant, red, Coke bottle-shaped Adirondack chairs and take in one of the best views of the Atlanta skyline. The press box and TV/radio booths, directly above home plate, have an incredible birds-eye view of the playing field. I was amazed at the nominal amount of equipment used in the booths to cover the games. The Braves Clubhouse and locker room are below ground level and not at all the lavish accommodations I expected. However, they do have their own chef who prepares meals before or after games and the fitness and medical facilities are impressive. The locker room is not part of the tour on days when the Braves have an afternoon game. 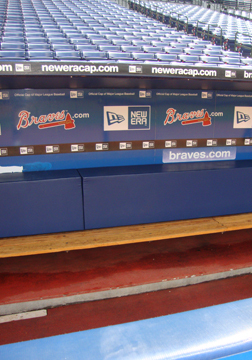 Sitting in the dugout was incredible, not only for the cool-factor of occupying the same space as Atlanta baseball greats such as Chipper Jones, Greg Maddux, and Coach Bobby Cox, but also for being as close to the home team as a fan without season tickets is likely to be. Walking out onto the playing field was phenomenal. We were of course given the obligatory "do not walk on the grass" directive, but otherwise we were able to explore the area between home plate and first base. The seats in the stadium seemed a lot smaller than the players look on the field from the seats themselves. The stadium looks massive from the field. You immediately realize what a big deal it is to be a super star baseball player. Touring Turner Field is truly an incredible experience and includes a lot more than I've shared here. It's also a great opportunity to pitch baseball stats back and forth with your tour guide—Rick was a real pro. Will I take the tour of Turner Field again? With it being easy to get to, having free parking, and only an hour in duration, it's a great option to add to one's list of things-to-do when friends and family visit. I'm sure I'll do it again. In the meantime, I now have some ultra-cool behind-the-scenes insight for when I attend the next Braves home game. Monday – Saturday – 9 a.m. – 3 p.m.
Sunday – 1 p.m. – 3 p.m.
Monday – Saturday – 10 a.m. – 2 p.m.